Everything tastes better in miniature form! And meatloaf is no exception. 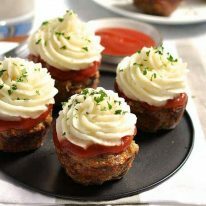 These cute little meatloaf cupcakes are irresistible to kids – big and small. And they bake in 20 minutes compared to about 1 hour for traditional meat loafs. I piped the mashed potato on for the photo but ordinarily I just pile it on then fluff it up with a fork – much faster! I really love meatloaf. But I find that to make a really good one, you need to make it big so you need to use at least 750g – 1kg /1.5 – 2 lb of mince. That is ALOT of meat! It is way too much for a family for one meal (unless you have an extraordinarily large one!). And to be honest, I am not the hugest fan of reheated slices of meatloaf. I don’t know why, but to me, meatloaf is one of those things that is sensational eaten fresh, then OK-ish the next day. Am I just fussy? So one of the reasons I started making meatloaf in muffin tins is because they are great individual size portions. Because each “cupcake” is browned on the outside, I find that they reheat much better than slices of a large meatloaf. The other reason I like making cupcake size meat loafs is because they cook much faster. A large meatloaf typically takes close to 1 hour to bake, whereas these little ones take around 20 – 25 minutes. The added bonus is that kids find these irresistible! OK, so I admit it, part of the reason these look so cute is because I went to the effort of piping the mashed potato on. And no, I would not do that ordinarily! Usually I just pile the mashed potato on, then fluff it up with a fork. You can bake these after putting the mashed potato on if you want. The mashed potato will brown nicely, like in these Shepherd’s Pie Potato Skins. However, I am partial to the mashed potato being soft and fluffy for this particular recipe, without a crunchy skin. The other tip is to increase the hidden vegetables. I only added grated carrots (and onion which is part of the base recipe), but you can add whatever shredded or grated vegetables you want. Shredded cabbage and spinach suits this well, as does grated zucchini. The mince mixture is quite wet and sticky so it will be able to absorb a decent amount of extra vegetables and still hold together – 2 to 3 cups. If it does start to crumble, just add a squidge of extra tomato sauce and/or an egg to bind it. These freeze really well. Once they have cooled, the mashed potato forms a thin skin so you can wrap them in cling wrap and it won’t stick to the potato. They also last well in the fridge for up to 2 days (probably 3, but I like to be cautious). I love a good meatloaf! Meatloaf – extra tasty, extra juicy, extra soft! Everything tastes better in miniature form! 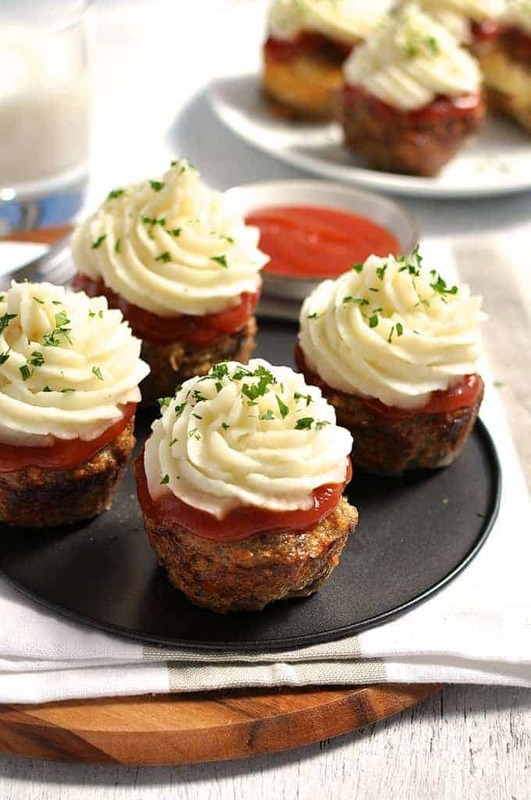 These Meatloaf Cupcakes are made extra irresistible by piling on mashed potato. These freeze very well. They are also great for hiding vegetables. 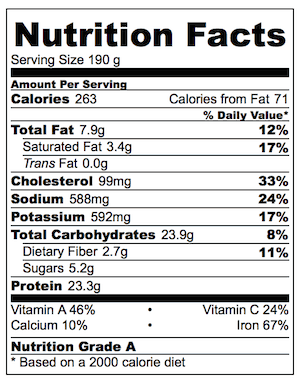 I only added grated carrot, but you can mix in whatever vegetables you want. Finely chopped spinach or cabbage would blend in well, as would grated zucchini. Spray 8 holes of a muffin tin. Grate the onion and carrot straight into a large bowl. Add remaining meatloaf ingredients and use your hands to mix and combine well. Scoop up 1/2 cup of mince and use your hands to form a rough ball shape. Press into the muffin tin. The surface should be a slight dome shape. Repeat with remaining mince. It should make about 8. Bake for 20 - 25 minutes until browned on top. Remove from oven. Peel and dice the potato. Steam or boil until soft but not waterlogged. Drain, then add butter and 1/2 cup of milk. Mash using a potato masher until smooth or to your liking. Add extra milk if you need it. The mash needs to be creamy but stiff enough to hold its shape when piped or piled onto the Meatloaf Cupcakes. 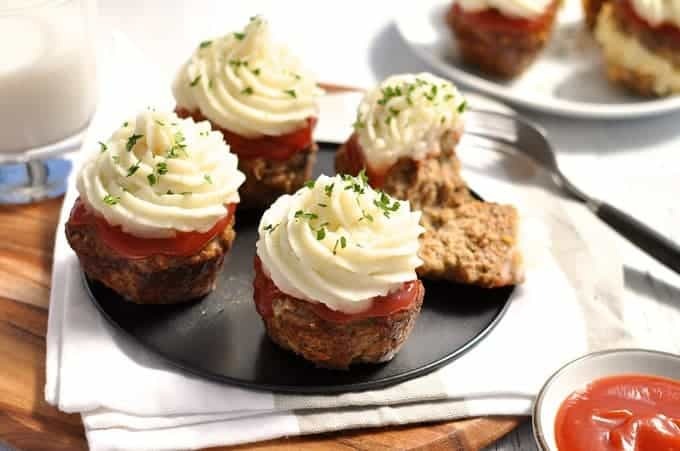 Smear a dollop of tomato ketchup on the Meatloaf Cupcakes. Top with mashed potato, either by piping it or just dolloping it on with a spoon. Serve with a sprinkle of parsley, if using. 1. After topping with mashed potato, you could bake it for 10 minutes to brown it, or place it until the grill /broiler for a few minutes. But I like the mashed potato without the crunchy surface – more like the icing you actually get on cupcakes! 2. To freeze, let the cupcakes cool then a fine skin will form on the mashed potato so the cling wrap won't stick to it. Wrap in cling wrap and place in freezer. To reheat, thaw then reheat in the microwave or oven. has anyone made these in mini muffin tins? Just wondering if they would make a nice finger food. I am going to make these for a group of friends but before I do what is the reason you used garlic powder versus fresh garlic sautéed with the onion? Also if I make and bake ahead is there any drying out once frozen and reheated? Hi Pam, you could definitely substitute fresh garlic if you prefer. These should be perfect to freeze! Great, Great, Great!! A hit with my family!! My 10yr old son is picky about foods touching each other and he loved this! I make my own brown sugar sauce and use crushed town house crackers instead of bread crumbs!! Nagi you are a genius!! Ty for your recipes!! I made this for dinner tonight and it was a hit!! Except for bread crumbs I always use crushed up TownHouse crackers and I have my own brown sugar glaze I make. Were not a big ketchup eating family. Thank you for your recipes!! This is great. I added some minced onion instead of fresh but it’s so good. I don’t have a meatloaf pan so cupcakes is easier. I’ve made this 4 times in a few months. These mini meatloaf muffins were fantastic! My son , who a picky toddler, loved them. Having him help was also fun. The idea of resembling a cupcake was an added touch..